At Office Clean UK, we specialize in “Steam” Super-Heated Water cleaning like ThermoTech, Torik and DOFF as well as hot and cold pressure jet washing. We use the latest cleaning equipment and a combination of cutting-edge products to SoftWash exterior services. We offer industrial pressure washing or steam cleaning for almost any surface including, paving stones, smoking areas, compactor areas, facades, cladding, tarmac, decking, render, timber cladding, petrol stations, roofs and service yards as well as many other surfaces covered in grime, dirt and algae. We can restore your building to its former glory, leaving people with a lasting good impression of your property or organization. The life of a building can be determined my many factors, maintenance of the external façade is of upmost importance in prolonging the life span of a valuable asset, ensuring that your environment is maintained in a safe and pleasant environment. From small to large jobs, no job is too small for us, we can also provide works at any height via rope access or from mobile access platforms. Over time, a buildings exterior will succumb to a build up of pollutants from the surrounding environment. 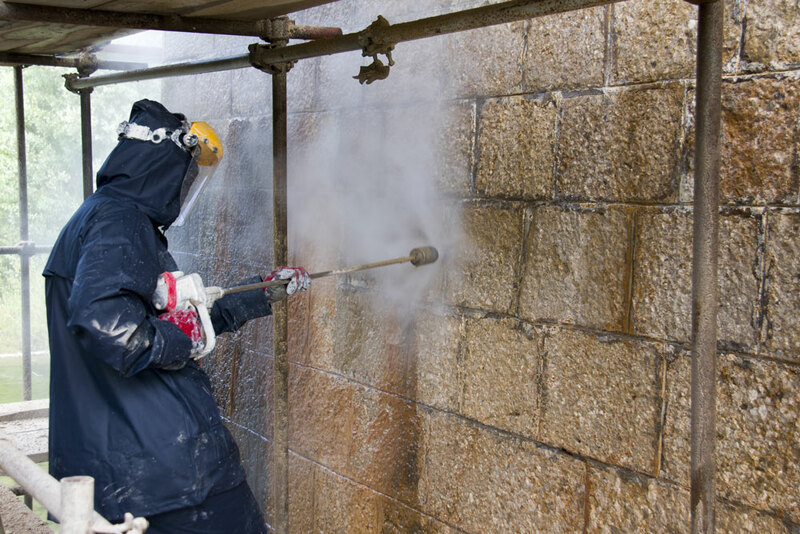 We can provide a range of methods to clean more sensitive, historic and Listed buildings. Using planned fabric maintenance will ensure your key building assets are protected! Building fabric maintenance has been treated as a reactive task, this leads to deterioration of the fabric and subsequent reduction in the asset value as well as impacting on the quality of the user experience for visitors and staff which can have an impact on the image of the organization. Due to high costs, more owners are looking to move away from reactive maintenance models and move towards planned models which ensure protection of their key building assets. We manage and deliver bespoke and site specific cleaning projects which require combined access solutions such as complex road closures and traffic management systems, all fixed access equipment including cradles, along with rope access, mobile access platforms, spider access and mobile and static scaffolding. Using strategic site access solutions. we can get the project completed effectively and safely with minimum disruption. We will use every available access solution, to enable us to save you time and money. We are a business that strives to help you achieve your desired result from your project. We offer Protective and Preservative coatings and sealants which will bring down the cost of your maintenance programs by prolonging and protecting the appearance of your building.